The glitz and glamour of the NFL draft is upon us, and as all eyes look to the draft there is the little matter of who will be selected with the No.1 pick, and what will they go on to achieve? Andrew Luck was selected from Stanford University after being thought of as making himself available for the 2011 draft, he decided to return for his junior season and was considered to be the steadfast #1 selection in 2012. The Colts did not disappoint in selecting him. His first pass on his debut was a 63-yard TD pass in a pre-season game and he went on from there to record 4,374 yards, 23 TDs and 18 Interceptions, as well as rushing for 255 yards and getting 5TDs. Luck went from there and continued to cement himself as one of the premier QBs in the league, making it to 3 Pro Bowls, and setting multiple NFL & team records. Eric Fisher was selected from Central Michigan, being touted as one of the top 32 players available in the draft class and one of the top offensive tackles in the league. He has gone onto make himself a regular for the playoff team. An offensive linesman who was switched to the RT position in the NFL he allowed 7 sacks in his first season, and 35 hurries. This led him to be ranked 70th of the 76 NFL tackles who had played at least 25 percent of their team’s snaps. The coaching staff still think that the has the ability to become a starter however and he continues to be a regular. Jadeveon was though to be a top prospect coming out of high school, and was considered one of the best prospects coming out of college into the NFL. He was added to the Texan’s mean defence, but despite his obvious talent he hasn’t been able to show it in the NFL due to injuries that he picked up in his first regular season game, missing the entire 2014 season. He did return for the 2015 season and was able to pick up some respectable stats (40 tackles, 4.5 sacks, 6 passes defended) from 9 starts. Although a lot was discussed about his character in the lead up to the draft, once he was in the league he looked like he belonged. 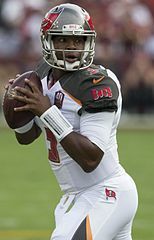 After a bad start in throwing his first pass for a pick 6 he went on to amass over 4,000 passing yards getting 22TDs on his way to that mark, adding that to the 6 TDs he rushed for he has a very promising rookie year, which culminated in him making the Pro Bowl (Tom Brady pulled out of the Pro Bowl, and Winston was the alternate). Whoever the Rams select with the first pick in the draft there is pressure on him before the first snap has been made. With the Rams moving city, and the amount of capital that was given up to get the pick there will be immediate pressure on the Quarterback, but as a famous philosopher once said “with no pressure, you don’t get diamonds”.